Last week’s experiments in graphing the availability of bikes on the cycle hire scheme have turned into the London Cycle Hire Explorer. Let me give you a little bit of the thinking behind it, if I may. 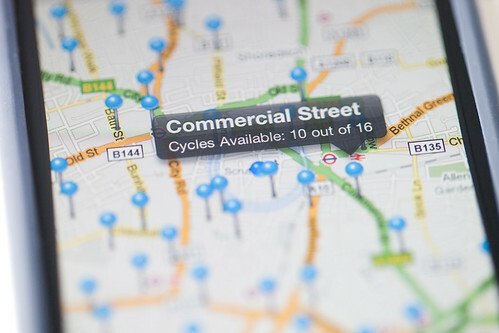 There’s a glut of mobile apps and sites available for locating a nearby bike station and showing live availability information. That’s awesome, and it feels like a little bit of promised shiny ubicomp future. But I want to just know which station to head for. I want to know that if I ride into town now, which stations are likely to be full, and which will probably have spaces. And if I stop en-route for fifteen minutes, how that might have changed things. If possible, I want to do that without having to pull over to poke at a screen or jiggle around trying to find 3G reception. I want to navigate on rules of thumb, hunches and gut feelings. And it seemed like pulling together as much data as is available, and presenting it in an easy to browse format, is a good way of beginning to feel the shape of the system, and starting to get those rules of thumb in my head. A few things I’ve spotted so far, most of which are obvious, but still interesting (for me). As you can see, by 9am the rack is full and people arriving are probably having to go to nearby stations to drop their bikes off. But that also means lots of bikes remain in the City during the day – which means it’s great for folk dashing around between meetings. Interestingly, Hop Exchange, Borough, was one of the busiest stations yesterday, presumably because it’s near London Bridge and started the day with a lot of bikes in the racks. However, it emptied slowly during the evening, and because no bikes were redistributed to it during the night it started today with only a few bikes available, and was empty by 7:30am. A bit useless for anyone planning on getting off a train onto a bike. I don’t know whether any kind of cycle hire system will be able to deal with the huge variability caused by commuters flowing in and out. Working how to appropriately balance/incentivise demand in those areas is going to be very tricky. Anyway, all of this is a massively overblown way of saying that I put some graphs on a website. It’s very basic, but as the data flows in, I’ll see what else can be done.